ABOUT GCI / SHANDRA STRINGER | Grassroots Consulting, Inc.
GCI is a consulting firm that provides services in the areas of technical assistance, training and development, multifaceted workshops, and other services that challenge individuals and organizations to be the best in their business in the Spirit of Excellence. Shandra Stringer is the embodiment of someone who works at the grassroots level to make a difference with individuals and organizations. 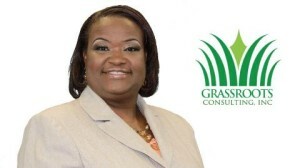 Shandra is the President/CEO of Grassroots Consulting, Inc. which provides services for Business Start-Ups (For-Profit & Non-Profit Sector), Corporate Training, and Capacity Building Services to Churches in the area of Church Administration, Development of Policies & Procedures, Financial Controls, & Fund Development. Her financial business of Stringer & Associates Financial Services includes Budget & Credit Counseling, Tax Preparation, & a licensed Insurance Agent that encompasses Life, Health, and Fixed Retirement Planning. Recently, she incorporated GCI Training & Empowerment Center, Inc. with a three-prong approach. The Urban Institute of Excellence in Certifications, The Total Woman Empowerment Group, & All About Excellence Catering Solutions are subsidiaries of GCI. Services include establishment of nonprofit organizations; board training & governance, resource development, volunteer & outreach recruitment, program design & development, small business start-ups, completion of minority and vendor registration, state and federal filings, a holistic women’s mentoring program, and Workplace Training & Employment Services. Shandra holds an A.S. degree in Business Management, a B.S. in Organizational Management, and a Master’s Degree in Nonprofit Management. Additionally, she holds a professional certification in Home Ownership and Community Lending. She is a certified in Financial Coaching as well as Certified Personal Financial Counselor. She is an Adjunct Instructor for Palm Beach State College. She is a licensed Notary as well as a Notary Signing Agent. Life’s misfortunes provoked her to become Certified in Food Addiction and most recently became a Certified Life Coach. Her professional affiliations include: Member of National Notary Association, Association of Florida Colleges, National Council on Black American Affairs, & board member of Habitat Housing Solutions, Inc. Her drive to make an impact in the world keeps her motivated to stay on this path. She perseveres to cheer on her daughter Relandria Adams who is a recent Graduate of the University of Central Florida.